Oscar van der Linden (1958) was raised in a creative family. His father worked as a draftsman, illustrator and photographer. His mother painted and wove in her free time. He started with photography with his first Agfa camera when he was 7 years old. He also made jewelry and used an enamaling oven. Despite this creative start, he worked for years as a business consultant and ICT specialist. From 1991 he followed a study for Graphic Designer besides his job. That was the start of the change in his profession. Since 2000 he works as an independant designer and started in 2012 his current company IkVerbeeldJe. In this company he combines graphic design with his artwork. Besides his independant artwork he also works on commisions for private and business clients. He experiments with materials and shapes. He zooms in to macro level and then takes his distance again. This zooming he often does with his camera. The result he uses as a start for his work of art. It leads to strong impressions in which you sometimes can see the origin of it. He works nowadays a lot with glass and other natural materials like wood. He is a people person who is passionate about making objects of art which fit to a certain person or special moment in life. 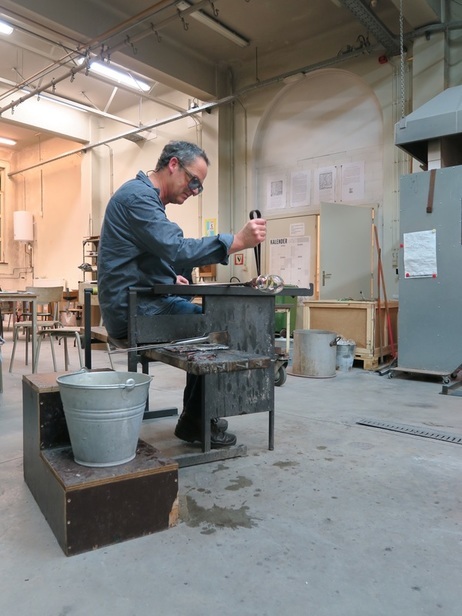 He is studying Glasart at IKA Glas in Mechelen (Belgium). Look also at www.oscarvanderlinden.nl about his independant work. He is also active on social media.